It’s spring and we can finally spend more time outdoors: how about an aperitif with delicious fresh baked wild garlic buns and a skyr dip? I’m sharing with you two recipes, one for quark bread with in-season wild garlic (or any other herbs of your choice) and one for a refreshing and light dip that goes wonderfully with those pieces of bread. Now to the very easy recipe: you can prepare the dough in a mixer or by hand. 1. Mix all the ingredients to form the dough, this will take a couple of minutes using a mixer and a little more if kneading by hand. 2. Let the dough rest, covered, for 30 minutes. 3. Line your baking tins with baking paper. 4. Form 10-12 buns of the same size (it will help to bake them evenly) and place them on the baking paper. Let rest for another 30 minutes. 5. Preheat the oven at 200 degrees (if using air 180). If your oven has a bread function, you may want to use it, worked very well for me. 6. If you have good salts, like the ones offered by Pfefferbraut, place some on the top of the buns, it will make them even more special! 7. Bake for approximately 20-25 minutes or until golden brown. 8. Let them cool down before enjoying! Mix all the ingredients to form the dough, this will take a couple of minutes using a mixer and a little more if kneading by hand. Let the dough rest, covered, for 30 minutes. Line your baking tins with baking paper. Form 10-12 buns of the same size (it will help to bake them evenly) and place them on the baking paper. Let rest for another 30 minutes. Preheat the oven at 200 degrees (if using air 180). If your oven has a bread function, you may want to use it, worked very well for me. 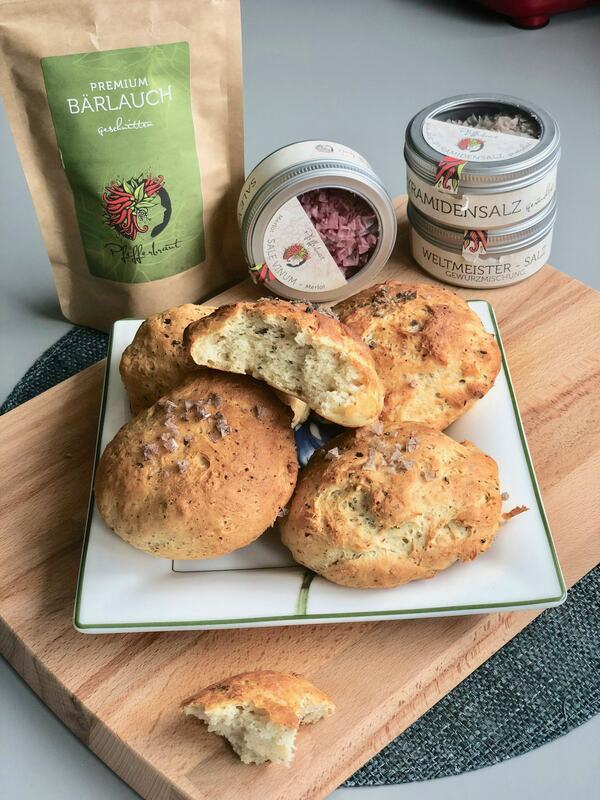 If you have good salts, like the ones offered by Pfefferbraut, place some on the top of the buns, it will make them even more special! Bake for approximately 20-25 minutes or until golden brown. Let them cool down before enjoying! I served those lovely buns, perfect also as a side for a bbq, with a simple but delicious radish-skyr dip. 2. Mix them with some Skyr. 3. Season with WM Salt or other special salts. 4. Decorate with fresh herbs. 5. 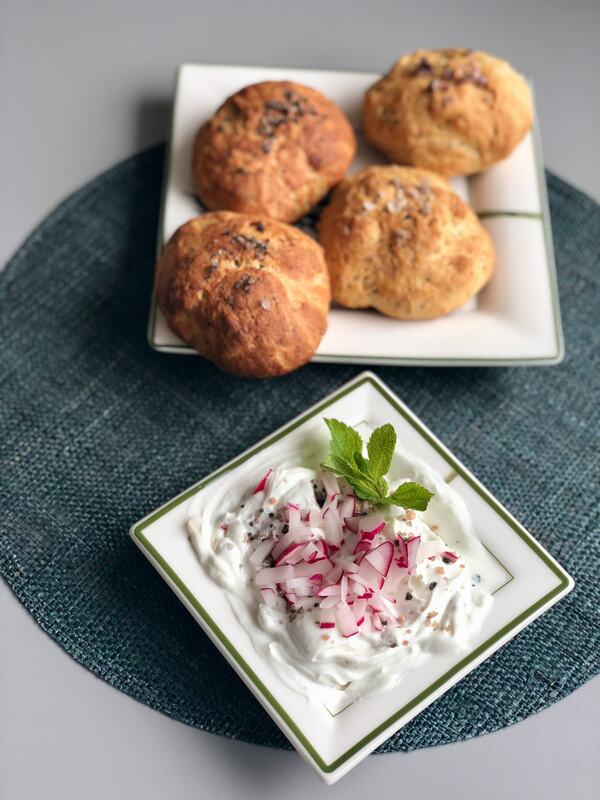 Go on and dip a piece of your freshly made herbs quark bun and enjoy! Looking for other tasty bread recipes, perfect for spring? 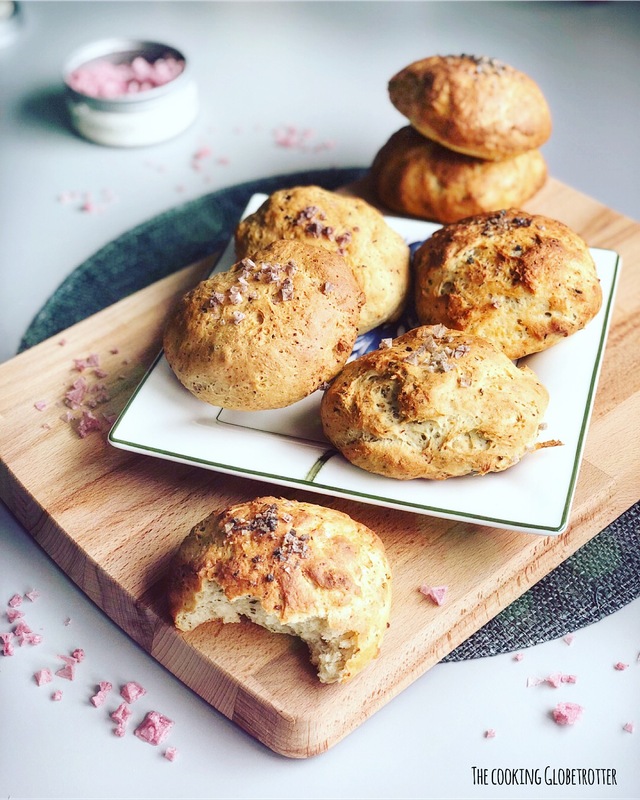 Check out my low carb herby ricotta bread!